Oh my how the time has flown. 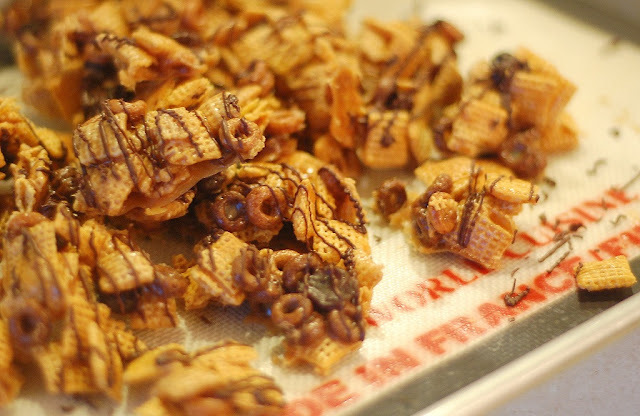 This week is the LAST Tuesdays with Dorie recipe and the end of the year! I remember the shock I felt at how heavy the book felt when I first opened it and the end has come. Since I joined TWD I have gained the confidence to try new recipes, make substitutions and adaptations, burned through a million boxes of butter, and made a lot of new friends. I'm so grateful to Laurie and Dorie and all the other helpers along the way for such a wonderful experience (and a million favorite recipes). 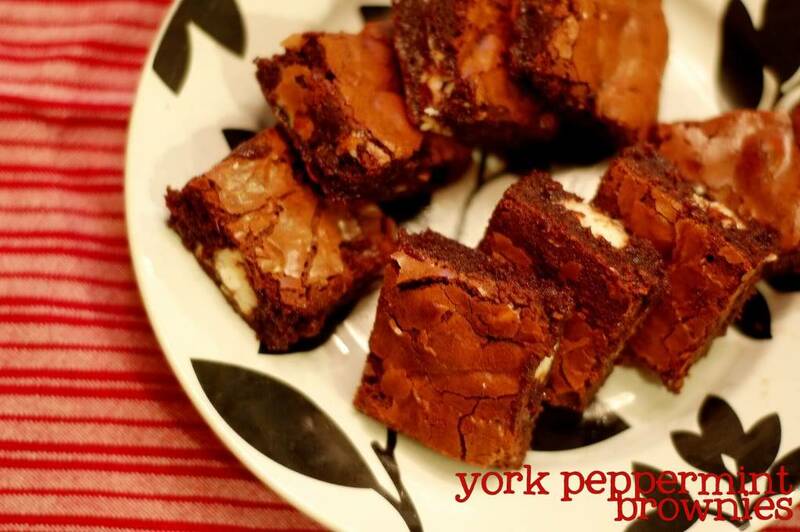 Dorie chose this weeks recipe. 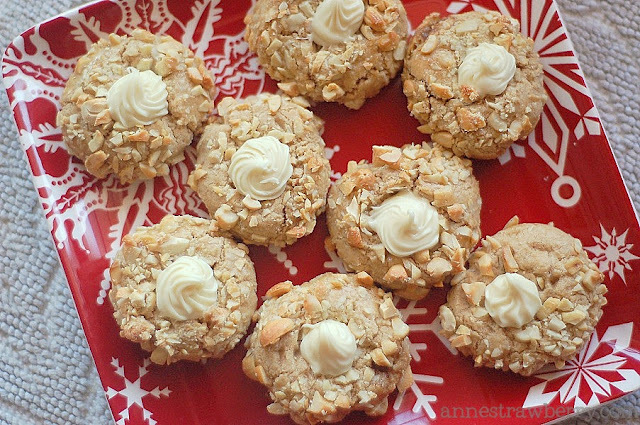 These cookies came together in less than five minutes- butter, peanut butter, sugar, eggs, vanilla, and a little flour. Scoop and roll in egg whites and then chopped nuts (I used cashews since I had those on had), make a little 'thumbprint' and bake. Dorie suggests filling them with jam but I piped in some melted white chocolate. The end product is peanut buttery, crunchy and delicious (albeit rich!) My kids LOVED these and I am glad to have some extra dough in the freezer for another day. See the rest of the bunch here. I hope you had a wonderful Christmas! We sure did. 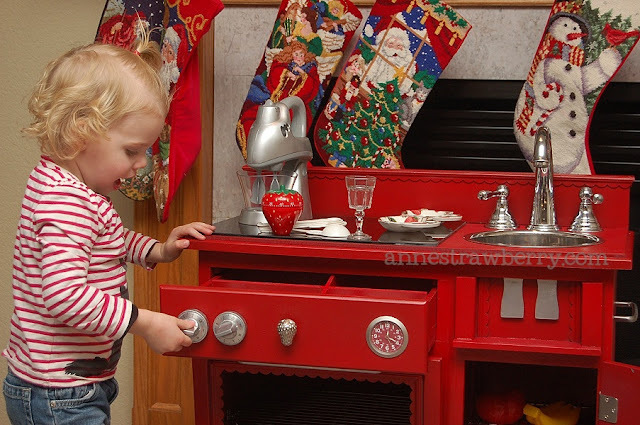 Baby Strawberry and I love her new play kitchen Nana built. It's shiny and red and came complete with her own KitchenAid (what more could a girl ask for?) Well, I do hope Santa drops off Baking with Julia a little late for me. 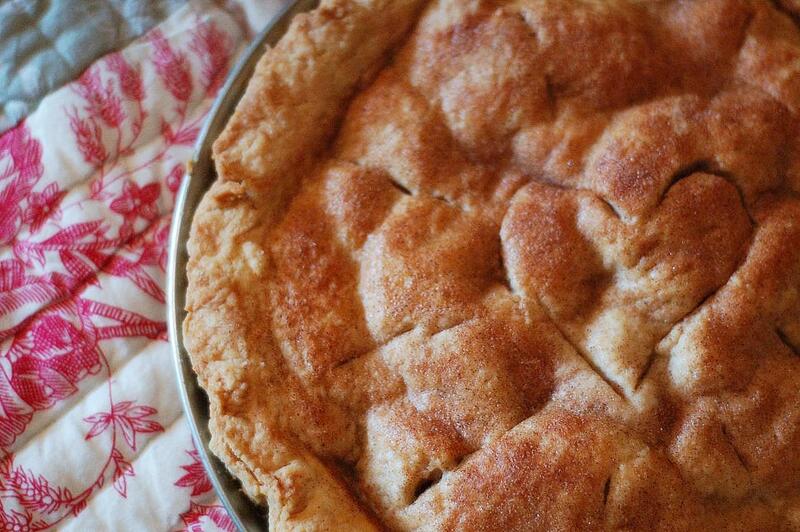 I think my kitchen wouldn't be complete without a Dorie recipe each week- though there are certainly plenty of Baking recipes in permanent rotation around here! 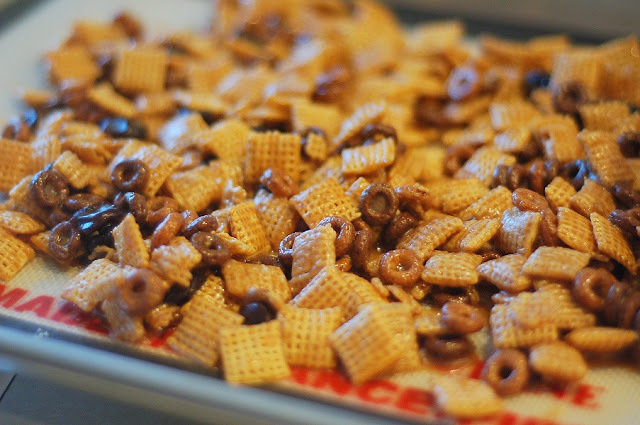 I'd like to thank everyone who entered the Chex Mix Party Giveaway from MyBlogSpark! I loved hearing about everyone favorite neighbor gifts to give and receive (check out some of the awesome suggestions in the comments here!) The winner of the giveaway (thanks to Random.org) is Laraine Eddington! Get me your address and we'll have it shipped out to you! She has the funniest blog, check it out! This is my little man's gingerbread house from last year- a small milk carton + graham crackers + royal icing (don't forget all the candy you can pile on!) My family makes these every year and it's a ton of fun for all ages! Definitely a favorite Christmas tradition. We are staying busy around here and enjoy the excitement and fun little kids bring to the holidays. They're already pretty hyped and the big day is still a bit away. It's going to be sporadic around here as usual but we're enjoying this special season with our families and that's the best part of all. 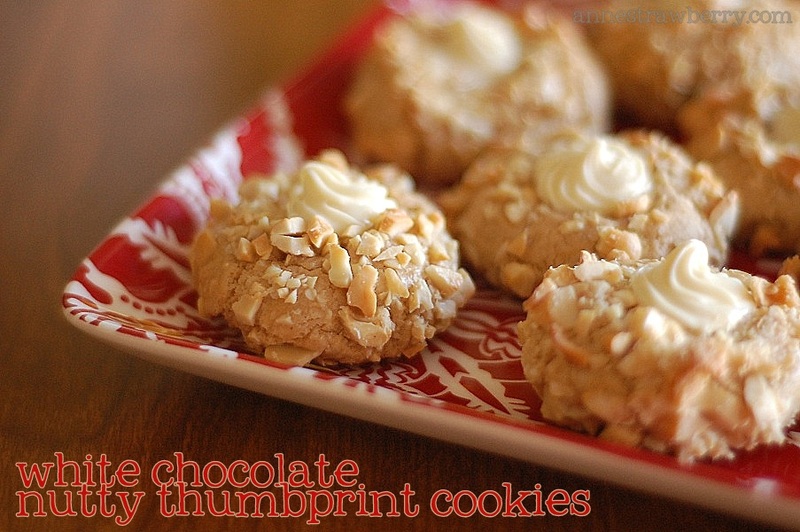 PS Need Cookie ideas? Millions here! 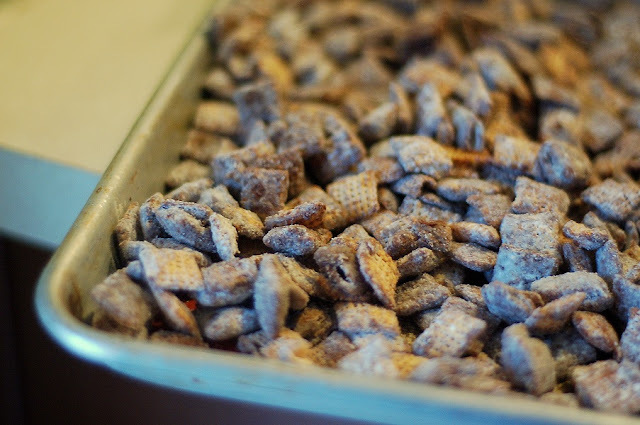 Last but now least- Muddy Buddies. I've never made this before but after I read the recipe I had a little Joey from Friends moment (remember with Rachel's Shepherd's Pie Trifle?) Chocolate? Good. Peanut butter? Good. Powdered Sugar? Good. No wonder I've always liked this stuff. 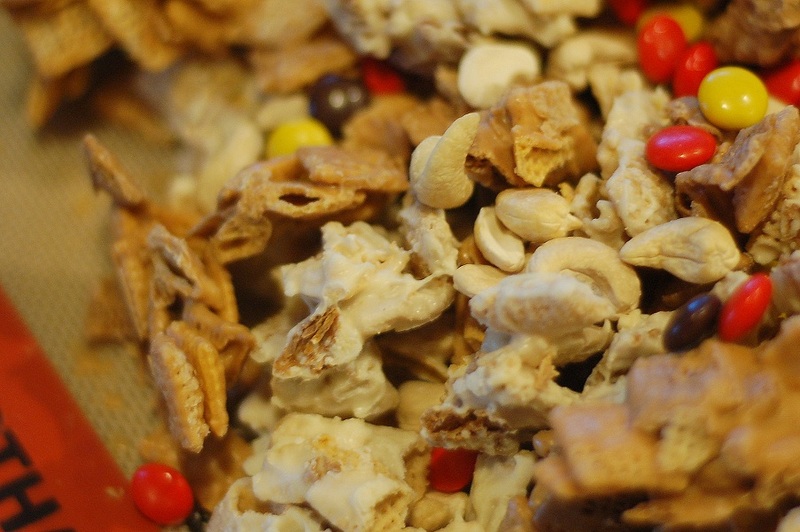 We loved making these different varieties of Chex Mix together and it was a fast, fun, and delicious activity- no stress, hardly any mess, and something for everyone. I have a gift pack to giveaway to one reader courtesy of MyBlogSpark. 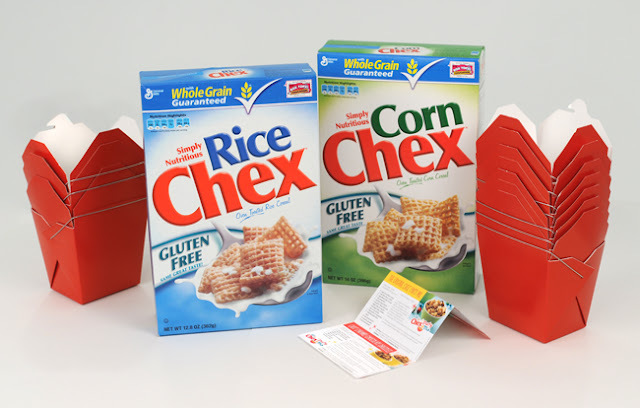 The winner will recieve a $20 giftcard to buy ingredients and decorations to go with the 2 boxes of Chex Mix cereal, recipes, and takeout containers to share your treats in. To enter the giveaway, just leave a comment letting me know your favorite Christmas neighbor gift to give (or receive!) US Residents only and giveaway will be open until Saturday night. "Disclosure: The Chex Party Mix-Change product, information, and giveaway have been provided by Chex through MyBlogSpark. "Opinions are my own. Brownies are my favorite treat to bake. The batter (delicious! ), the ease, the endless variations- they're a bakers dream. 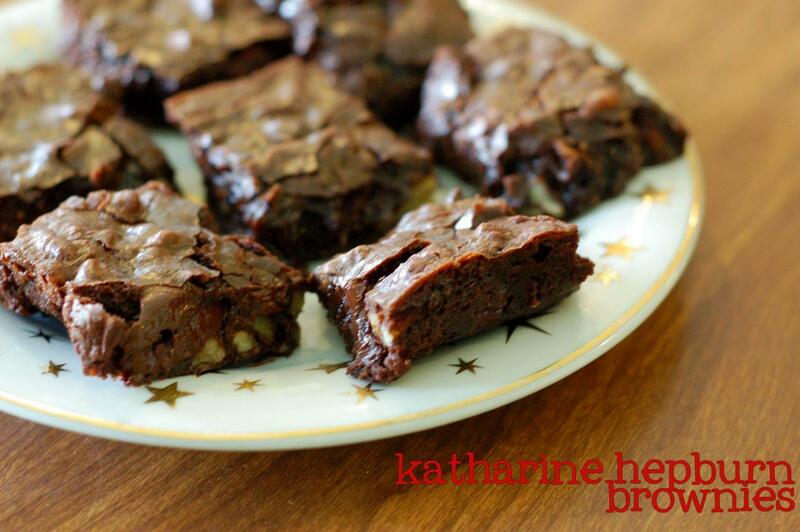 Plus, who doesn't love a brownie (besides my non-chocolate eating husband, but he still loves the smell!) A few weeks ago I made Dorie's Bittersweet Brownies- using semi-sweet chocolate of course. This recipe, chosen by one of my favorite bloggers, Leslie, is the last brownie recipe in the book for Tuesdays with Dorie. I can't believe it! See the recipe on her blog here. Brownies make the perfect neighbor gift and there are a million types to choose from. 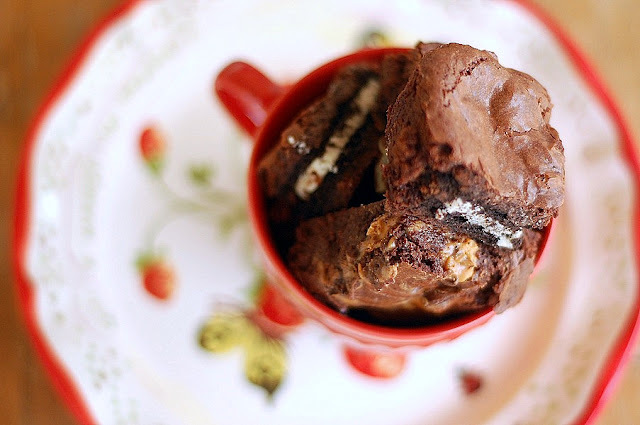 Here are a few of my other favorites from Dorie and you can see a bunch more in my brownie category. 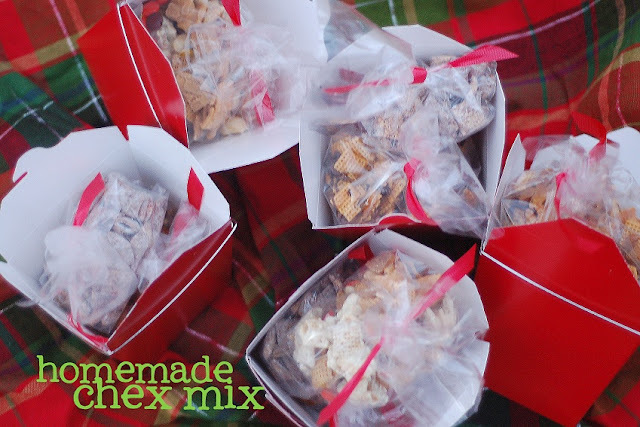 Come back tomorrow for another great neighbor gift idea (Chex Mix three ways) and a special giveaway from MyBlogSpark!